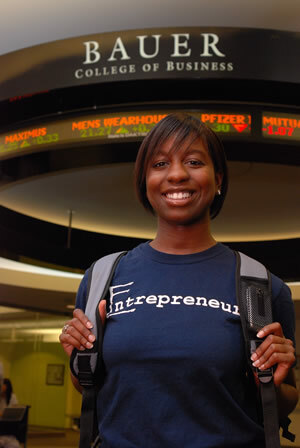 Entrepreneurship spells opportunity for entrepreneurship and finance student Ashley Sutton. HOUSTON, TX, Sept. 9, 2008 – The entrepreneurship program at the University of Houston’s C. T. Bauer College of Business has made a giant leap from number two to number one in the country on The Princeton Review’s list of top undergraduate entrepreneurship programs in the U.S. for Entrepreneur magazine. The Cyvia and Melvyn Wolff Center for Entrepreneurship at UH Bauer is the nation’s leading entrepreneurship program on the 2008 Top 25 Undergraduate Schools for Entrepreneurs, which was released on Sept. 9. The program was ranked No. 2 in 2007 on a list that also included Baylor University, the University of Arizona, Notre Dame, University of Southern California, University of Maryland and Syracuse University. Houston Mayor Bill White lauded the achievement and praised the college for continuing the city’s long history of being a haven for successful entrepreneurs. “Houston is a great city of opportunity in large part because we’re not satisfied to rest on our laurels. The Bauer College’s No. 1 ranking is an example of that kind of energy and commitment to excellence. Houston is fortunate to have such an asset,” White said. University of Houston System Chancellor and UH President Renu Khator agreed, noting that the ranking also brings distinction to the University. “This top national ranking by the entrepreneurship program at the Bauer College of Business is another bold step toward greatness and adds to the University of Houston’s stellar reputation as an outstanding, highly respected metropolitan university,” she said. “It is an impressive achievement that validates our commitment to student success ― not just at the Bauer College, but throughout the university ― as we strive to provide the support and environment that allow our students to develop the skills they will need to be successful in their lives,” Khator added. Bauer College has been educating business leaders for decades, with the Wolff Center for Entrepreneurship cementing the school’s status as a leader in entrepreneurship when it was created in 1993. The Commission for Higher Education approved entrepreneurship as a major in 1995. Since then, the program has flourished and now attracts more than 1,800 students a semester. The program has also gained respect from members of the Houston community, who mentor students in the program. Longstanding and highly respected Houstonians Cyvia and Melvyn Wolff became the namesakes of the program in January 2008. Wolff is a 1953 graduate of Bauer College and a member of the Dean’s Executive Board. Before 2007, Bauer’s entrepreneurship program was recognized regionally. This national ranking is indicative of the tremendous growth and breadth of the program, which educates business students as well as those from other disciplines through its global business minor, said program director Dan Steppe. “The Wolff Center is teaching an entrepreneurial process that is equally applicable to any major at Bauer and students across the University. We do not teach about subjects; we teach how to use information. The power of this is that you have a highly transferable process. About 40 percent of students involved in the Entrepreneur program are not business majors, and 53 percent of undergraduate students at Bauer participate in the program,” Steppe said. The ranking also validates the world-class education Bauer students have been receiving through the Wolff Center’s entrepreneurship program, its global business minor and its intrapreneurship certification program, he added. “Most importantly, students are starting businesses. In the past year, 50 percent of the students started a business while enrolled in school, and 80 percent of them are still in business today,” Steppe said. In addition, the WCE certification program in intrapreneurship is the foundation of the college’s global business minor for non-business students. More than 700 non-business students take WCE courses each year and have an opportunity to see how entrepreneurial thinking can be applied to their interests in engineering, science, social science or the arts. Between 2005 and 2008, an average of 65 percent of WCE students started a business while in school or shortly after graduating. WCE students have also won numerous awards in national business plan competitions — even outperforming MBA teams from other schools including Carnegie Mellon. Students in Bauer’s executive MBA program have also had the opportunity to take elective courses in entrepreneurship and intrapreneurship. “It is just one more example of Bauer’s quality. We have been recognized for high quality programs in almost every field of business — MBA, Investment Management, Accounting, Global Energy Management, Selling, you name it — and this is just one more example that we have great programs,” said Dr. Edward Blair, chairman of the Department of Marketing & Entrepreneurship. The Kaufman Foundation has estimated that approximately 495,000 people per month created new businesses in the United States in 2007. Small firms have generated 60 to 80 percent of new net jobs annually over the last decade and produce 13 to 14 times more patents per employee, according to the U.S. Small Business Administration. The Princeton Review determined the rankings by evaluating key criteria in the areas of academics and requirements, students and faculty, and outside-the-classroom support and experiences from more than 300 undergraduate programs that were surveyed. UH Bauer will celebrate on Oct. 30 with a special Distinguished Entrepreneur Speaker Series in Cullen Performance Hall.